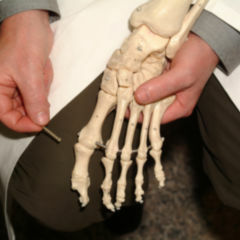 The foot skeleton forms the bony basis of the foot. 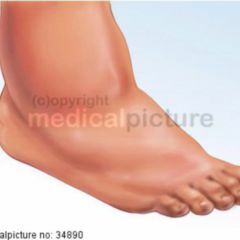 The foot skeleton is - excluding the sesamoids - made up of a total of 26 individual bones which can be subdivided into the tarsal bones (ossa tarsi), metatarsals (ossa metatarsal) and phalanx (ossa digiti pedis). 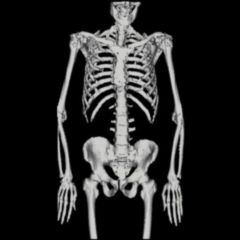 The bones of the foot skeleton are held together by numerous ligaments and interconnected by joints. 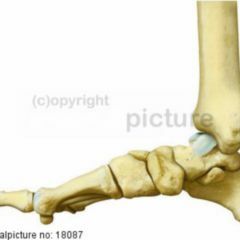 The tarsus is from a functional stand point referred to as the hindfoot. Metatarsals and toes comprise the forefoot. Furthermore 2 sesamoid bones belong to the foot skeleton, the ossa sesamoidea pedis.